A CLUTCH of Camden gym starlets were jumping for joy after their latest outing. 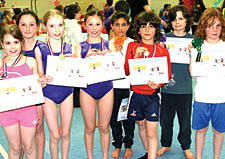 Chloe Tansley, Daphne Rutman, Alexandros Charalambous, Amelia Johnson, Eligerta Hajdarmata, Oliver Lloyd Williams and Joshua Parkinson put on a super show to win top honours in the Camden Gymnastics Club Championships. They were among more than 800 youngsters from the club, which is based at the Talacre Sports Centre in Kentish Town, who were given the chance to experience what it’s like to take part in competitive gymnastics. The talented six to 16-year-olds (pictured) put on a series of graceful displays as they performed floor routines and vault exercises in front of friends and family.